Making chanachur reminds me Chira Bhaja / Fry Flattened Rice. I used least amount of ingredients and love flavour. Some of us can say to use more ingredients. But to me less is more. If you want, you fry peanut and flattened rice together. But I prefer to do separately to make it perfect. If you are buying flattened rice from Bangladesh, make sure there is no sand in it ( we are not washing it )So enjoy authentic Bangladeshi (without any doubt) munchies and I am pretty sure that your kids will love it too. 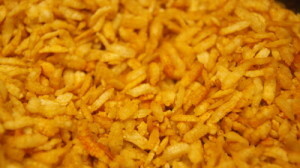 Add oil in a pan on medium and when oil is ready, add flattened rice and salt. 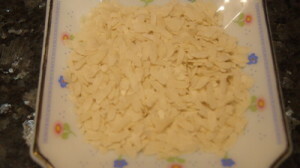 When flattened rice will be bit puffed and crispy, add chilli powder and black salt. Mix all ingredients together and remove from heat. 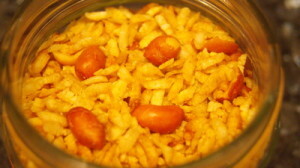 Pour fried flattened rice in a bowl and in same pan roast peanuts with salt on medium heat. 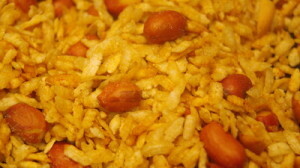 Mix roasted peanuts and fried flattened rice together. When it will come to room temperature store it in an airtight container. It keeps fresh for month. Enjoy Chira Bhaja / Fry Flattened Rice simple Bangladeshi munchies.